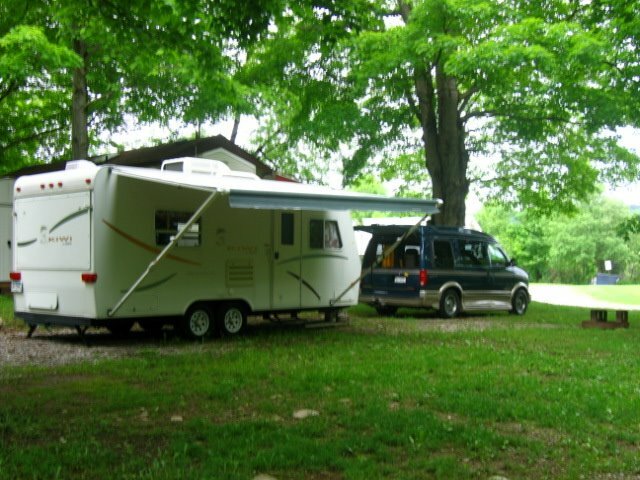 The first trip of the 2006 season was to Tumble Hill Campground, at 10551 Atlanta Back Rd. in Cohocton, NY. Cohocton is in the southern tier region of New York state, just off the exit two of I-390. Last time the census was through this town, they managed to count 838 people… mostly of German and Irish decent. Translation; this is not exactly a big town. It’s name is derived from the Iroquois term for “log in the water”. Their annual big to-dos are the fall foliage festival and the annual tree sitting contest. We found the campground itself surprisingly good. The usual assortment of site types , a recreation hall, a rental cabin, and a rental trailer, fire rings with thoughtfully added adjustable cook surfaces on them, and Cable TV hookups for those rigs equipped with them, are just a part of the package. Since we needed to flush the water system, we opted for the full hookups, and the which ran us a surprisingly low $26 for the night, and included 30 amp service and water and the Cable TV, too. Since my driveway is too narrow to open the awnng, my first order of business was to get that up and airing out. This required about 10 minutes as I reacquainted myself with the task. 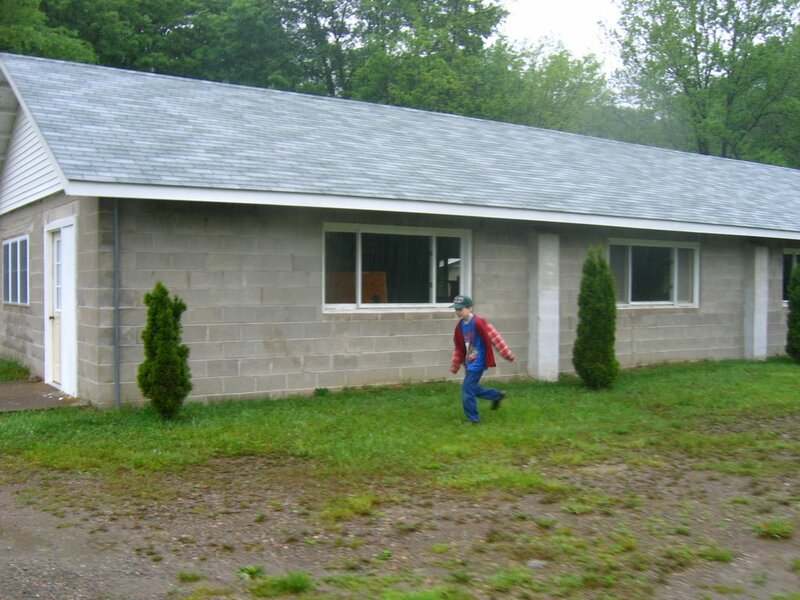 From there, it was get the ends out, the beds laid down, the sewer hooked up, the power hooked up, the water hooked up, and the TV cable hooked up. Perhaps another 20 minutes. At that point, I actually had time to take in some of the surroundings. It really is a beautiful area and reminds one of the Smokey mountains, at times… Particularly if it’s raining. This turned out to be one of those times. Frankly, I should have figured on this. Memorial day weekend was hot and dry but we’ve waited because of reservation concerns; in short we forgot to make reservations so we didn’t bother going. We decided to go the following weekend… and were rewarded with the rain. Still, it wasn’t all that bad. We managed to get a good fire going, With wood we purchased on site, (A rather generous supply for $4) and ended up cooking our hamburgers and hotdogs on the open fire…. the wood smoke adding it’s special taste. Dinner (and washing up ) completed we then set about making sure all the systems in the trailer were working. The heater seems to work fine. The air conditioner while we didn’t need it, was tested anyway and it appears it’s going to need a recharge of R134. The cable system worked very well. Battery, lighting and water systems all worked well. One small issue that came up that we hadn’t known how to fix at the time was that the outside power outlet wasn’t working. It wasn’t until we got it home, that we realized what was going on; the outdoor plug shares the circuit with the indoor plug under the rear bed. The indoor one, has a ground fault interrupter, which had tripped. Next time, we’ll know. Still, the place was dead quiet at 10pm, and it was very nice to listen to the rain falling on the canvas. A relaxing sound, really… and I’ve not slept quite that well in a long time. You’re only a short hop away from many different activities most within about ten minutes drive of the place. Some of the more distant drives include stony brook state park , Hammondsport, Corning, Letchworth state Park, Watkins Glenn, and Canandaigua. There’s a laundry available for your use, as well as sand volleyball courts , horseshoe courts , a phone room with a modem hookup, crafts for the kids every Sunday, along with a morning social and Sunday with free coffee and snacks. If there was a drawback to the place, it’s the road leading in… and up. Seriously up. 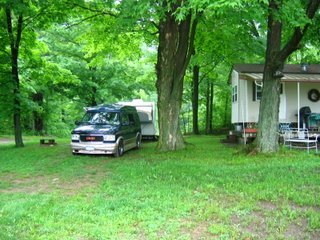 Nothing insurmountable, but the gravel road leading up into the campsites from the main office, well kept as it was, was a challenge to my slightly underpowered rig. Getting up the thing is a matter of some finesse instead of brute force. On the whole, we were impressed. We will be back. The added horsepower from the mods done over the winter (intake and exhaust) made quite a difference on the flat, but not as much in the hills as I’d have liked. I found myself shifting mentally into ‘chug-along’ mode more often than I wanted to, particularly on the stiffer hills. Also the MPG was a tad lower than I’d estimated based on the Lake Ontario and Lake Erie runs of last fall… At the time, I recorded 13mpg. However, this run, which gave us a bit more in hills, gave us a bit closer to 10mpg. Livable, certainly, particularly with a CVGW of around 10,000lbs… but hardly anything to write home about. Still, when one considers that I’m getting 22mpg on the open road without the trailer, that’s not bad.